Winter settles early in Mount Huangshan coating everything in white. When Huangshan opens for its winter season December 15th, we invite you to share the magic of the Mount Huangshan with Yellow Mountain Tour. The rime covers the trees, snow mantles the grotesque peaks, steaming hot springs, spectacular sunrise and sunset... Let's step off the beaten path to truly experience a crystalline wonderland. Day3 Visit Yellow Mountain and Hot Spring Scenic Area. Day4 Visit Hongcun Village and Luchun Village. Transfer to train station/airport. You are met on arrival at Huangshan Tunxi Airport and transferred to your hotel. Then you are picked up to visit Tunxi Old Street . 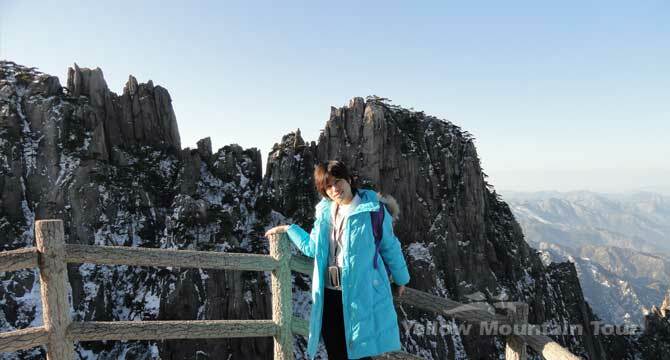 1.5 hours to the foot of the Yellow Mountain ( Mout Huangshan). Ascend the eastern side of the mountain by cable car, then begin the 7 km (4.3 mile) hike to the western side of the mountain. On the hike we will take in Huangshan's most spectacular views and ascend its highest peak - Lotus Peak (5,900 ft). If weather is fine, watch the beautiful sunset in Cloud Dispelling Pavilion. Stay overnight on the summit of the mountain. Driving westward for about 1.5 hrs to see Hongcun Village and the woodcutting houses in Lucun Village. Depart with transfer to Huangshanbei (North) Railway Station or Tunxi Airport.